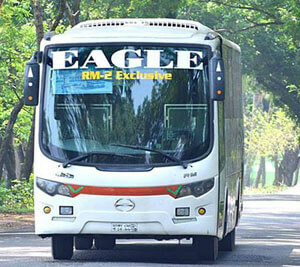 Eagle Paribahan is the most famous and established transport and bus service of Bangladesh. Over 1 million passengers every year prove the acceptability of the bus service. It covers all reachable areas of Bangladesh such as called Tecknaf to Tertulia. Eagle Paribahan has more than 300 buses along with about 1500 trained staffs. You can get Eagle Paribahan service information from any of its counters. The main office of the company is in Gabtoli Bus Terminal, Dhaka. You can reach them at Tel: 02-9006700. You can buy your necessary ticket from any counters of Eagle Paribahan. You can also book your seat over a phone call. The manager of the counter will provide your booked seat after your payment. You can also buy Eagle Paribahan online ticket by visiting shohoz.com. Buying a ticket from online is very easy. It saves your valuable time and money. You can buy Eagle Paribahan online bus ticket from shohoz.com. Sohoz.com offers TK 150 off for the online booking. You can visit the website and get TK 150 off. But the biggest offer is to use the app. You’ll get up to TK 300 by using the app. Just download the app and log in to book your ticket. Like Shohag Paribahan, Eagle Paribahan provides international route service. The bus goes to Dhaka to Kolkata. You can find more information by visiting any of the counters across the country. Eagle Paribahan provides improved service which is not available most of the transport services. You can have a safe journey if you follow all the regulations provided by the authority. You can also complain about any disgrace or can suggest them by commenting or calling over the phone. Any of your opinions will be evaluated by Eagle Paribahan.